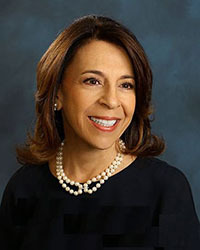 The Honorable Linda J. Briskman (retired March, 2009) was elected to the Beverly Hills City Council in March, 2001. She served as Mayor in 2005. Prior to being elected as a council member, she was a City commissioner for 12 years. Mrs. Briskman was a founding member and served as Chairman of the Westside Cities Council of Governments (COG). The COG is a joint powers authority of five cities including Beverly Hills, Culver City, Santa Monica, West Hollywood and the western portions of the city and county of Los Angeles. These cities have partnered to forge consensus on policies and programs of regional significance with transportation enhancements and improving the plight of the homeless as their top priorities. In addition, during her term of office Briskman lead the City of Beverly Hills in it's Legislative Advocacy and Government Affairs both in Sacramento and Washington, DC.. She also served as Chamber and Marketing council liaison for most of her eight years as an elected City official. She now serves on the Board of the Beverly Hills Conference and Visitor's Bureau as the Board liaison to the City. In 2006, following her year as Mayor, Linda was honored in Sacramento by then Assemblyman Paul Koretz as "Woman of the Year" for the 42nd Assembly District. In 2009 she received the President's Award from the West Hollywood/Beverly Hills Democratic Club. In 2010 Briskman, was appointed to the California State Parks Commission by Governor Arnold Schwarzenegger. The Briskman Family have been members of Brentwood Country Club since 1989. Her husband Gary served on the Board of Directors for six years before her. Linda has been a Board member of Brentwood for six years and is currently in her second year as President. She has also served as Treasurer and Vice President of the Board. Linda is an avid golfer and has resided in Beverly Hills for over 35 years. She and Gary have five children and six grandchildren.